According to the National Institute of Neurological Disorders and Stroke, Bell’s palsy is a form of temporary facial paralysis resulting from damaged nerves in the face. The 7th cranial nerve, one of the main nerves in the face, travels through a narrow, bony canal in the skull to the muscles on each side of the face. When Bell’s palsy occurs, the facial nerve’s function is disrupted, causing an interruption in the messages the brain sends to the facial muscles. A possible result of this interruption is facial weakness or paralysis. Is Bell’s palsy contagious? Read more to learn about the causes and treatment options for this condition. Bell’s Palsy Is Not Contagious. Although Bell’s palsy is not contagious, the illnesses that are thought to cause it can be. Some of these illnesses include the common cold, herpes simplex 1 (cold sores), and viral meningitis. How do these viruses lead to Bell’s palsy? Because Bell’s palsy occurs as a result of a swollen, inflamed, or compressed nerve, many medical professionals believe that the swelling of the facial nerve is in reaction to an infection. The disorder has also been associated with influenza, chronic middle ear infection, diabetes, Lyme disease, skull fractures, and high blood pressure. Approximately 40,000 Americans are affected by Bell’s palsy each year, the majority of whom are older than 15 but younger than 60. People who are at a higher risk for Bell’s palsy are those who have diabetes or upper respiratory conditions. Bell’s palsy affects everyone differently, and there are several different treatment options. If you think you may have Bell’s palsy, it is important to see a medical professional immediately to help determine the best treatment for you. Some common treatments are physical therapy, steroids, acupuncture, and vitamin therapy. For milder cases of Bell’s palsy, no treatment is required, and the condition will clear up on its own within a couple weeks. 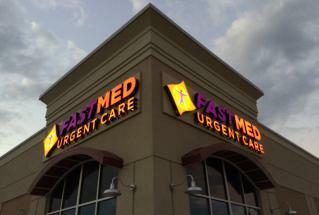 FastMed Urgent Care is a network of walk-in clinics throughout North Carolina and Arizona that specializes in prompt, personal medical care for a wide range of conditions 7 days a week. FastMed Urgent Care has been awarded the Joint Commission’s Gold seal of Approval for Accreditation in Ambulatory Care by demonstrating compliance with the Joint Commission’s national standards for healthcare quality and safety in ambulatory health care. Whether you have a non-contagious condition such as Bell’s palsy or something with a higher risk of transmission, FastMed medical professionals are equipped to give you the care you need. We never require an appointment, strive to see every patient in an hour or less, and accept most forms of insurance. Check out our ZipPass to get started!